(HARLINGEN) – Johnny Rivera, a Computer Networking and Security Technology student at Texas State Technical College and U.S. Navy veteran, joined the Veterans Upward Bound program in Spring 2018. Veterans Upward Bound is an organization aiding veterans in Cameron County and providing a way to level the playing field between those continuously pursuing education and veterans that serve and then return to school. 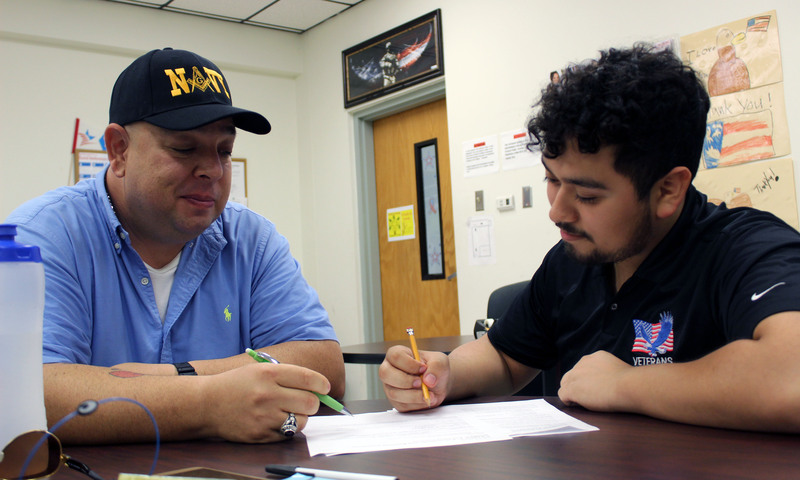 The program hosted by the University of Texas Rio Grande Valley at TSTC’s Veterans Center also provides one-on-one tutoring services, equipment such as calculators and laptops, financial aid assistance and preparatory TSI tests. Rivera described the program and his time at the Veterans Center as pleasant and accessible with many resources to meet his day-to-day tasks. Rivera, who plans to graduate Summer 2020 with an associate degree, said the program has helped him tremendously. Jose Villegas, TSTC Veterans Center program officer, said when UTRGV reached out to TSTC to establish a partnership with Veterans Upward Bound, they knew they had to accept. Villegas said the program is able to become more accessible now that it is at TSTC and grow in the number of veterans served in Cameron County. Lizette McNaine, a Veterans Upward Bound program representative, said she sees the partnership with TSTC and the program expanding in the future. The Veterans Upward Bound program grant began in 1999 and was recently approved for another five years. For more information about the services offered at the TSTC Veterans Center, call 956-364-4386.